Being the very first segment of the home to greet the guests and family members, the entryway or the mudroom must be a well-organized, clean and beautiful spot of the whole space. Organizing clothes, shoes, backpacks and nitty gritty household supplies would become a piece of cake with the below awesome mudroom ideas. Welcome everyone home with a cozy and inviting space adorned with natural decor items, while serving the purpose of an awesome mudroom at the same time. This stunning mudroom gets it coziness with lots of neutral-hued cushions, a pine cone and pumpkin wreath, and a milk crate with loaded with white pumpkins and birch log. As functional as it’s versatile in terms of matching just about any interior, this mudroom drip station is going to store all the shoes in the entryway with a dash of style. The boot-drying tray showcased in the below Pin is actually constructed using a wooden tray, wherein all you need to do is to fill the tray with small rocks and pebbles, and voila! How minimalistic does this mudroom look without even compromising on storage space is the best part! And yes, it also serves as the laundry, the shoe drying station and coat hanger for the house. The different materials employed for its construction, including slate herringbone floors, shiplap walls and butcher block counters make it oh so vivid. The moment you enter the house, you have got a compact mudroom enclosed behind those lovely cupboard doors on one of the walls of the entryway. Below the doors are super handy drawers that work wonders for storing shoes, while the cabinets can be used to hang all the clothes, jackets, blazers or scarves you need to remove immediately after entering your house. Not only the compact construction, but that beautiful color scheme of all white makes this mudroom standout with grace. A small sitting section adorned with loads of cozy pillows blends comfort with functionality, letting you store nitty gritty items in the baskets on top. You have got ample of cloth hanging hooks, cabinets and drawers to make the storage truly effortless. Right from building appropriate storage units in the available amount of space to a consistent color scheme, from creatively designed shelves to clever shoe section, there’s so much that goes into the making of inspiring and efficient mudrooms or entryways. This guide by Apartment Therapy takes you through 10 such wonderful tips. Putting on a pair of shoes becomes so much more easier when your mudroom comes equipped with a comfortable sitting section. This inspiration by BHG features a 2-seater bench to make that happen. Even that space underneath the bench can be put to great use by keeping all the footwear you remove or wear while leaving or entering the house. If nothing else matters more to you than keeping everything simple yet convenient, then this mudroom setup is your destination. It provides easy storage with cabinet drawers meant for small things, hooks for coats and scarves, as well as sports a lovely seating area to put on shoes that are stored in floor-level compartments. Even your bags and sunglasses have got their spots reserved! It perhaps, can’t get any better than this mudroom that makes the most of a truly small space. A bunch of simple hacks get it done with true elegance, wherein wall hooks attached to a strip of wood help you keep your bags or jackets in place, while that boot tray at the bottom is keeps the floor all clean. A 2-seater bench brings out the much needed comfort. How about putting a whole wall to use to craft a beautifully spaced mudroom that blends organization with an element of chic. The back wall features several cupboards and drawers, having a lovely oval-shaped window in the middle. The special element here is two half-wall shelves that allow you to store toys, books or even small storage baskets. 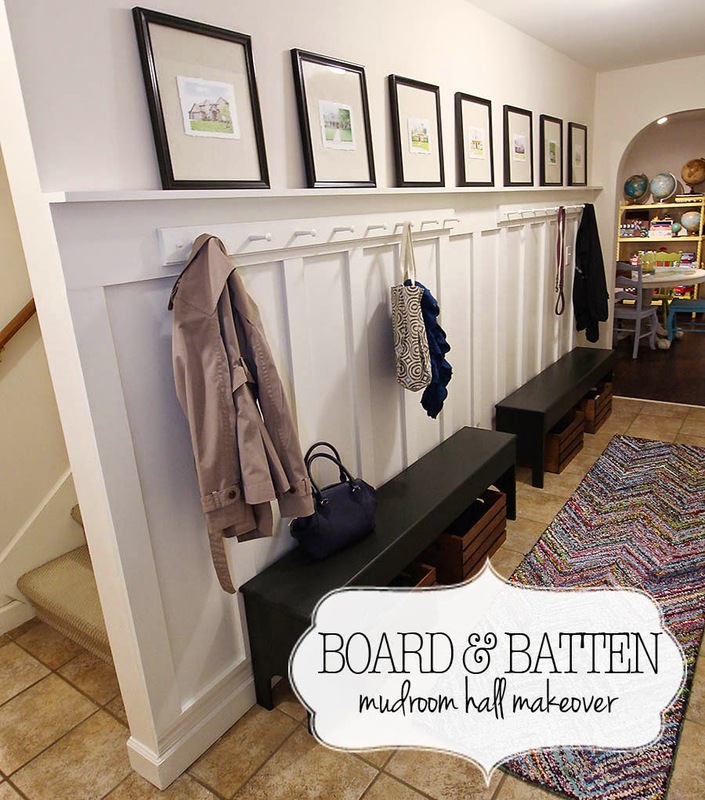 Charmed up with a splash of black, two compact benches offer seating space in this mudroom hallway that has got an easy board and batten as its building blocks. The below guide by Paper Daisy Design showcases how to build the batten boards using plywood, refined with several coats of gloss trim paint. Peg hooks allow for an easy hanging of clothes and bags.